Choose from 15 locations. Chances are we have an opportunity that matches your background and your career interests perfectly. We're investing in our facilities. And in our people. 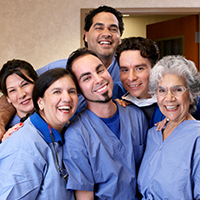 Imagine where your talent could take you when you build your career with HCA East Florida. It's a $650 million commitment to our people, our patients, and to the communities we serve. At HCA East Florida, we are focused on delivering the highest quality patient care on a daily basis. We are making significant capital investments to improve our already state-of-the-art facilities, further develop top talent, and elevate HCA East Florida to an even higher level of excellence. Now all we need is for you to invest in us. HCA East Florida is the largest health system from the Treasure Coast to Miami Dade County and encompasses 14 affiliated hospitals; multiple ambulatory surgery centers and imaging centers; physician practices; four free-standing emergency care facilities; a supply chain center and an integrated regional laboratory. HCA East Florida employs more than 16,500 individuals and has more than 6,000 physicians on staff with an economic impact well over $2 billion. HCA East Florida Hospitals provide $290 million in healthcare services to those unable to pay for their care and has the largest emergency room network and operates the most trauma centers in the service area.